. . . beauty of orchestral sound is one of [the CD's attractions] . . . [Dvorák]: [Weilerstein's] playing is assured and vibrant in the big-boned, romantic melodies of the concerto's outer movements. She and Mr. Belohlávek capture the tender longing of the wistful adagio, with its ravishing interplay of the cello, flute and other woodwinds. And her soulful solo passages add measurably to the final movement, whose sweet pastoral coda brings the concerto to an atypically subdued close until its final, impassioned utterance. It's the take-no-prisoners emotional investment that is evident in every bar, but never more so than in the heart-wrenching slow movement, where Ms. Weilerstein's cello appears to take on human shape. The arrangements of songs and dances by Dvorak for cello and piano are also beautifully sung. Alisa Weilerstein demonstrates her flawless technique and unflagging, seemingly innate musicality . . . Adding authenticity to her rendition of his Cello Concerto is the polished Czech Philharmonic Orchestra under the direction of Jirí Belohlávek. After an invigorating opening, by turns anthemic, pastoral and lyrical, Weilerstein enters with deep sound and authoritative playing. Her precision and rhythmic drive in vigorous passages and taut trills bring out the tension as the work escalates. By contrast, she employs an appealing sense of breadth to long-lined, singing phrases. Throughout, she is keenly sensitive to shifts in dynamics and mood and finds a compelling variety of tone colors, from a vulnerable whisper to a sentimental, rhapsodic quality and, finally, a rustic character to the folk-inflected finale. Anna Polonsky proves a worthy accompanist in a series of songs and shorter works, including a tender rendition of "Goin' Home," a melody from Dvorák's Symphony No. 9. In Dvorak, she demonstrates her patented, artistic resolve and firmness of musical purpose, as she intones a fiercely personal statement in a work already documented with the composer's own romantic sub-text, his long-unrequited love for Josefina Cermakova. Jiri Belohlavek . . . coaxes a suave, flexible cushion of sound to support Weilerstein's ardent lyricism, realized with [directness of expression] . . . The conductor's long familiarity with the score makes every sonic detail pertinent to the whole, especially as Dvorak's interior voices constantly evoke pastoral and sometimes tragic elements . . . in the second movement her fluidly large and expressive tone proves ravishing in its elegiac song, itself interrupted by a passing reference to Josefina's favorite "Lasst mich allein" that the composer twice quotes in the course of the "Concerto". The crisp attack, relatively free of ostentatious vibrato, with which Weilerstein opens the "Finale: Allegro moderato", begins a marvelous collision of disparate forces, not the least of which involve Belohlavek's inflamed woodwinds and tympani. The momentum of the third movement again flows with an authority and fervor that compel repeated hearings. Weilersten's cello seems to muse in a world of flowers, birds, and vivid landscapes . . . The haunted song "Leave me alone," so dear to Dvorak's beloved and to his concerto tribute, receives a touching realization, lilted at every turn. The 1891 "Rondo in G Minor" casts both a gypsy and somber glow at once, and Weilerstein captures its elegiac poise as much as she fashions its more impishly virtuosic outer sections. Much in the Feuermann tradition, she exploits a passionately direct attack that plays with the phrases in pushes and pulls, as she chooses . . . ["Silent woods"]: The musical gambit of "G Minor/Major" makes its final appearance in the marvelous furiant of "Op. 46, No. 8", the "Slavonic Dance" that concludes that earlier of the two sets of dances. The busy cello line and swelling, insistent chords from Polonsky's keyboard attest to an athletic as well as aesthetic partnership of superb musicianship.
. . . Weilerstein brings her ardent charisma to the beguiling music of Dvorak . . . [Cello Concerto]: she demonstrates her patented, artistic resolve and firmness of musical purpose, as she intones a fiercely personal statement in a work already documented with the composer's own romantic sub-text . . . [Jiri Belohlavek] coaxes a suave, flexible cushion of sound to support Weilerstein's ardent lyricism, realized with a directness of expression . . . The conductor's long familiarity with the score makes every sonic detail pertinent to the whole, especially as Dvorak's interior voices constantly evoke pastoral and sometimes tragic elements . . . in the second movement her fluidly large and expressive tone proves ravishing in its elegiac song . . . The crisp attack, relatively free of ostentatious "vibrato", with which Weilerstein opens the "Finale: Allegro moderato", begins a marvelous collision of disparate forces, not the least of which involve Belohlavek's inflamed woodwinds and tympani. The momentum of the third movement again flows with an authority and fervor that compel repeated hearings. Weilersten's cello seems to muse in a world of flowers, birds, and vivid landscapes . . . The last pages bristle with a rare alchemy of lyric and bravura digital facility . . . ["Leave me alone"] receives a touching realization, lilted at every turn . . . ["Rondo"]: Weilerstein captures its elegiac poise as much as she fashions its more impishly virtuosic outer sections. Much in the Feuermann tradition, she exploits a passionately direct attack that plays with the phrases in pushes and pulls, as she chooses . . . ["Goin' Home"]: The cello treatment by John Lenehan permits Weilerstein a sweet line or long-held, resonant tone in virtually every one of the cello's registers . 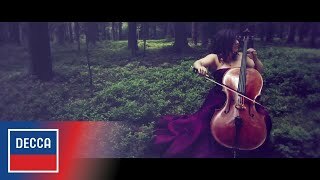 . . ["Silent woods"]: The busy cello line and swelling, insistent "chords" from Polonsky's keyboard attest to an athletic as well as aesthetic partnership of superb musicianship.
. . . [Cello Concerto]: [from the moment of her entry in the first movement] we are aware of her flawless and stimulating technique, producing thrilling sonorities with assurance and rhythmic precision. Under Belohlávek, the Czech Philharmonic has regained the sound and authority of the past, playing with palpable enthusiasm and partnering in a very exciting and satisfying performance, superbly recorded . . . [Rondo & "Silent woods"]: Weilerstein excels with an engaging rendering of each piece, closing out this most welcome disc.
. . . the young American cellist surmounts another of the great core works of the repertoire, the concerto by Dvorák, filled out with six miniatures including the G minor Rondo, "Silent Woods" and a Slavonic Dance, for which Anna Polonsky provides limpid piano accompaniment. In the concerto, the Czech orchestra and conductor, for whom this music must be second nature, establish a backcloth that is warm, luminous and animated by a tangy freshness, as indeed is the playing of Weilerstein. Hers is an interpretation of passion. It is by no means heart-on-sleeve but, rather, it is distinguished by well-harnessed vigour and attack, susceptibility to the music's lyrical heart, and by a range of tone that traces the concerto's expressive contours with the assurance, sweep and attention to nuance that derive both from mature artistry and from a deep understanding of the music's emotional trajectory. There is a spine-tingling thrill and generosity of feeling to this performance that make it irresistible.
. . . [Weilerstein] is joined by the Czech Philharmonic Orchestra under Jirí Belohlávek in a reading remarkable for its freshness and expressive freedom, with unexpected ritardandos and accelerandos: the American cellist plays across the bar lines, stressing the fluidity and intimacy of Dvorák's lyrical lines, as if conversing with the music itself. There are no mannerisms.
. . . it's the initial impact of Alisa Weilerstein's unbelievably rich entry with her strongly voiced cello in the Dvorák march opening that grabs you instantly. Heart and cello are one . . . [she] serves the most moving Dvorák concerto I have heard. How disarmingly unforced and personable the Czech Philharmonic sound in the Concerto's introduction, Jirí Belohlávek providing a quietly authorative, glowingly affectionate launching pad for Alisa Weilerstein's superbly articulate entry . . . she has a real feel for this repertoire. Not only does Weilerstein possess a flawless technical address, lustrous tone-production and intrepid range of dynamic, her playing evinces a captivating candour and risk-taking flair that not only succeed in activating the goosebumps (always a good sign) but also make you hear the music with fresh ears. For all the red-blooded temperament and freewheeling spontaneity on show, though, it's in the concerto's softer, frequently chamber-like passages that Weilerstein and those inimitably songful Czech winds really come into their own, the music's intimacy and sense of loss conveyed with the most raptly instinctive poetry imaginable . . . I also greatly enjoyed the remaining items, which find Weilerstein striking up a tangibly communicative rapport with Anna Polonsky (whose quick-witted pianism is a constant pleasure). Both "Silent Woods" and the Rondo are essayed with genuine aplomb . . . a disc worthy of the highest plaudits.
. . . beautifully played . . . Alisa Weilerstein is extraordinary. The volatility of her first entry galvanises the performance . . . A mixture of muscular virtuosity and radiant reflection marks the middle part of the first movement. Her performance of the slow movement reveals a profound understanding of the relationship between the solo part and the multi-faceted delicacy of Dvorák's orchestration, while that of the finale confirms that this is one of the great ensemble performances of this concerto available . . . a performance to treasure. She brings much elegance and power to this Dvorak . . . Fiercely talented cellist Weilerstein joins a deep-hued, unified, fervent Czech Philharmonic Orchestra for Dvorak's Cello Concerto, a striking centerpiece for a recording devoted to the composer. Her confident, warm, burnished sound lends itself well to the intrepid quality of the opening and to swooning, rhapsodic passages. She also displays ease, presence and vigor in elaborate runs as well as touching tenderness in the brooding adagio. The orchestra's mighty, glowing brass serve victorious moments wonderfully, and the twining of the violin solo with Weilerstein in the finale is lovely. [Cello Concerto]: Herrlich knarzend und fast atemlos setzt Weilerstein ein mit ihrem ersten Solo, trotzig und nachdrücklich. Doch vor allem bietet ihr diese erste Passage die Möglichkeit, all ihre klanglichen Facetten zu zeigen, was Weilerstein mehr als beherzigt. Mit fast kindlicher Leichtigkeit und Spontaneität schwebt sie durch diesen Anfang, benutzt ihr Cello wie eine Zigeunerfidel, bis zu dem Moment, auf den Liebhaber dieses Cellokonzerts hin fiebern: das sehnsuchtsvolle zweite Thema . . . Die Drahtzieher im langsamen Satz sind zu Beginn ganz klar die Holzbläser, die auf den Einsatz des Cellos vorbereiten. Ausgesprochen schön gelingt das in dieser Aufnahme . . . [das Rondo] reiht sich zu solch gesangvollen Stücken wie "Stille Wälder" und Dvoráks "Zigeunermelodien", die alle den gleichen warm-romantisch leuchtenden Grundton verströmen . . . Polonsky am Klavier begleitet feinsinnig und aufmerksam, Weilerstein kann sich problemlos in weiche Pianissimo-Klänge zurückziehen, ohne klanglich unterzugehen. Und gerade weil sie nicht nur wunderschön säuseln kann, sondern auch herzhaft Bogen und Griffbrett einzusetzen weiß, sollte man sich ihre Dvorák-Aufnahme nicht entgehen lassen. Nach ihrem beachtlichen Decca-Debüt mit dem Elgar-Konzert präsentiert sie sich nun mit dem meistgespielten aller Solokonzerte für ihr Instrument. Und sie schlägt dabei nicht den einfachsten Weg ein, der darin bestehen würde, die Sinnlichkeit des Werks für sich sprechen zu lassen. Dafür wäre Jiri Behlolávek sicherlich auch nicht der richtige Partner. Beide teilen offenbar die Ansicht, dass Dvorák mehr ist als ein Komponist süffiger folkloristischer Weisen. Sie lassen den Hörer am Reichtum der Farben, am dichten Stimmengewebe, der raffinierten Harmonik des Werks teilhaben und geben so den Blick frei auf Dvorák, den Intellektuellen . . . Zu Beginn des zweiten Satzes etwa halten sich Weilerstein und Behlolávek an die pastorale Stimmung, biegen die Musik nicht zur leidenschaftlichen Szene um. Weilerstein gibt hier die Dialogpartnerin des Orchesters, drängt sich, etwa in den Holzbläser-Episoden, nicht ungebührlich in den Vordergrund. Im Finale wird der Volksmusik-Anklang von Solistin und Orchester vorbildlich unverkrampft mitgeteilt. Hier haben aber auch die dramatischeren Passagen jene Geschmeidigkeit und Deutlichkeit der Diktion, die man in pathetischeren Darstellungen vermisst. [Eine der] besten Aufnahmen des Jahres 2014 . . . Der Beweis, dass es möglich ist, leidenschaftlich zu spielen, ohne ins Pathetische abzugleiten und volkstümliche Noten hervorzukehren, ohne sich anzubiedern.
. . . [Cello Concerto]: [Alisa Weilerstein joue] avec une technique impressionnante . . . une lecture qui se découvre de plus en plus intéressante. L'Adagio ma non troppo est d'une expression puissante, massive presque, mais suffisamment bien articulée pour que cela fonctionne. Le Finale possède un côté grandiose . . . En conclusion, une lecture assez cohérente, brillante . . .